dave's theory that it is a Bradwell Abbey issue (major BT node) seems to be right as other users (different ISPs too) on local exchanges seem affected too. 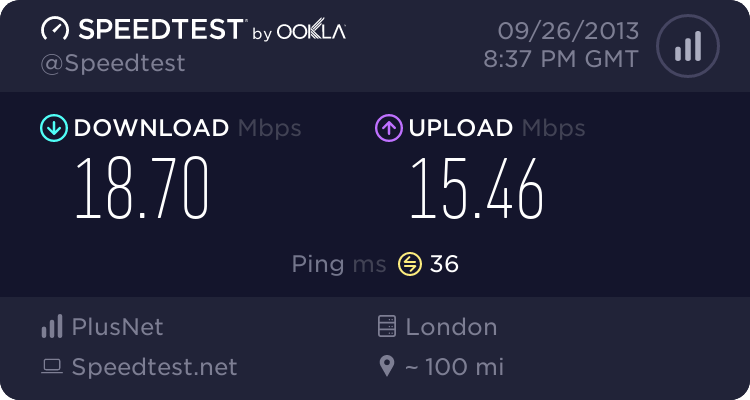 Could it be a result of extra connections being re-routed? I was thinking that but apparently the BTW network wasn't affected. Some peering companies (L3) were affected though. O2/Sky said they were going to re-route traffic to another local data centre. And they haven't actually successfully re-routed those affected in the Nortampton area and this is only around 360 customers. Deleted - may well be completely irrelevant. Looking at the TBB monitors, there's mine (W23), MrRich Thomas and kmilburn - all on FTTC showing the unmistakable 'volcano'. No monitors on non-fibre showing this anomaly (maybe just not enough monitors to have one in the area). Expecting an update from BTW this afternoon. I don't have a fixed IP, anyway... happy to help with info! Let's see what tonight brings. Possibly Bradwell Abbey (MK) Node... or possibly not? Though BTw's routing might mean my connection goes through there, I'm not in or near Milton Keynes or Northampton. Sunday night is normally busy and there appear to be no latency issues so far tonight - so problem/issue fixed? @ Superzoom - I think this problem isn't related to your issues (due to the timing). Dave mentioned you can sometimes find out your BRAS from the router PPP logs. If you can find yours, it might be worth setting up some ping monitoring to check performance. You're probably right, Andy. Certainly no repeat tonight. In fact, flat as a pancake, with a very fine dusting of peak time yellow. Couldn't even describe it as a hump. Had a quick glance at the logs, but no indication of BRAS in the ongoing keep-alive chatter. Might be in the connection setup further back.